Tip: Don’t be afraid to cook the duck for longer at a slightly lower temperature so that the meat is falling off the bone. Welcome along foodies, we hope you had a great year and enjoyed trying out our recipes along the way. What was your favourite one?? With the days being a touch colder, it’s definitely feeling very Christmassy here at the Culinary Food Group – we’re positive it’s going to be a white Christmas this year!! Our chefs have been busy experimenting with lots of mouth-watering Christmas dinner ideas lately, so we thought it would be nice to do a little Christmas Recipe Series this month. Up first is our starter for December – Duck Rillettes. This gem is actually a lot easier to cook than you’d think and works really well as a tasty lunch or as a starter. Here’s what you’re going to need…..
To make the salting mixture, thoroughly mix the salt, garlic and herbs in a small bowl, crushing it together lightly. Lay the duck legs in a single layer in a baking tray, sprinkle with half the salting mixture, press it in, then turn over and sprinkle with the rest. Cover the tray, then put in the fridge for at least 12 hours. The next day, rinse the legs in cold water to remove the salt mix and dry well with kitchen paper. Heat the oven to 130°C/110C Fan. Heat the duck fat, stock and white wine in a large pan until steaming. Put the duck legs in a small roasting tin and cover with the mixture – the legs should be completely covered. If there’s a lot of duck poking out, add more melted fat or wine. Cover the duck in the tin/casserole with a sheet of non-stick baking paper, then cover the tin with foil and seal. Cook for 3-4 hours, checking halfway through to make sure the legs are covered by the fat. If any of the legs are above the fat level, turn them over. The legs are ready when the meat falls off the bone. Remove the duck from the fat, once the fat has cooled slightly, pour it into a jug. Leave the duck legs to cool, then pick off the meat and shred finely into a bowl. Pour some of the reserved fat onto the duck, then work it in with your hands. Keep adding the fat in smallish additions until the mix in the bowl is roughly 50-50 fat to meat, cover with a thin layer of duck fat to seal. 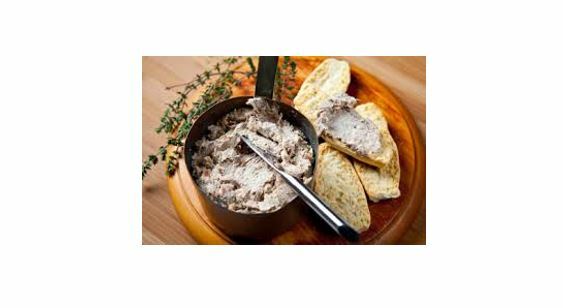 Remove from the fridge about an hour before you want to serve the rillettes, to take the chill off. Serve with pickles and toasted sourdough. If you’re interested in creating some new and exciting recipes get in touch with us and let our team of chefs help you to come up with something special.